One more summer collection, this time it's a collection of four bright cremes from Orly. Calypso Breeze. A dreamy bright blue creme. I don't have much to say about this- the picture says it all. It's beautiful. It is somewhat similar to Essie Mesmerize, but I don't have them to compare side-by-side at the moment. Mint Mojito. Bright mint green creme. This reminds me of the color of mint chocolate chip ice cream! It's more of a bright green-yellow than I had anticipated. I thought it might be a match for MAC Peppermint Patti, but when it arrived I realized I was wrong! It is much better and brighter in real life. I am in love with this color. Right on, Orly!! Sol Cabana. Soft yet bright orange creme. This is a lot softer looking in real life- these pictures seem to make it look almost neon, but it reminds me more of orange juice. It is quite bright and colorful but still has a soft, almost pale look to it- this seems to contradict itself, but once you see it in real life, you'll understand what I'm trying to say! Teeny Bikini. 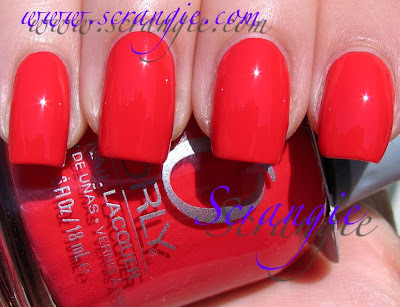 Ultra bright red creme. Is there such a thing as neon red? Because that's what I would call this. This red is SO BRIGHT. It stands out so much against my skintone that you can't help but stare at it. This is definitely an attention grabbing sort of color. The formula on these was wonderful. 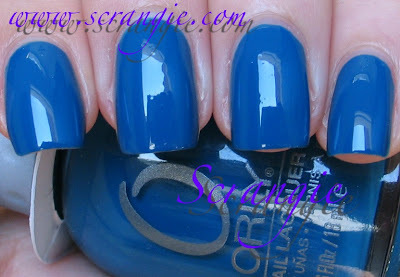 Thin, smooth, no runny/thick three free formula like a lot of other Orly polishes have. Drying time was much faster than I'm used to for Orly. Maybe they're working on their formula a little? These pictures are all three coats of polish. They were a little sheer due to the thin texture of the polish, but they looked decent at two coats. I wanted to be absolutely sure they were 100% opaque, so I did three coats. You could probably get away with two. Other than Mint Mojito, none of these colors are entirely unique. You could probably find matches for them from multiple brands- right off the bat, three of the colors are pretty close to three from the Misa Living On The Fast Lane collection. But still, they're gorgeous and if you don't already own similar colors they're worth having in your collection. Overall, this is an awesome collection. I love every single color. I love brights, I love blue, I love green, I love orange, so I knew this would at least have three things I liked. The red was a total surprise. I don't normally like red, I find it boring, predictable and overdone, but certain shades of red appeal to me. There are a few reds that I really love- Maybelline Juicy Tomato, OPI Vodka and Caviar, OPI Keys To My Karma, Zoya America, Essie Russian Roulette, Essie E! Live From The Red Carpet, and now this. It's also a nice small collection- easy on the wallet. Even better, this collection comes in a set of minis as well! It's a cheaper way to try out the collection and I really appreciate that Orly is making it more affordable to try their colors. Minis rock. Mint Mojito is LOVE!! I love minty colors and for sure I'll get this one. I'm new to Orly, I only have their Bonder basecoat, and Mint Mojito will be my introducer (: Yay! I like this collection. Like you said, it's small but I think it has great summer colors and the Mint Mojito is very 'fashion forward' for lack of a better word. Looks great on you! Pretty colors. Look so pretty on you. Most every polish I see I like. Except for all the sheers. Does Mint Mojito resemble 'OPI Greenwich Village' at all from last years mod about brights? It looks similar, I don't like buying polish doups grr lol. HeidiB, the first two are definitely my favorites! Anonymous, isn't it?! I adore it!! Mary, thank you! I am really, really digging Mint Mojito! Lucy, I have the same problem, I fall in love with every polish! I love mint mojito! I love greens like this one, they seem very wearable yet super-fun too! I love mint mojito! i also want Sol Cabana. But i have brights power by opi. Do u think they could be a good dupe for each other? I love this collection! Mint Mojito is absolutely gorgeous. Where can we purchase these? I don't see them on Orly's website. Scrangie, great swatches (as always). I looove this collection, I want all of them! I was so happy to read that they will come as minis, but I can't find anything on the net yet. Will minis be available in the on-line stores (if you know)? Thank you, your blog is fantastic! Vanessa, they are really fun and wearable! Jackie.jaci, Brights Power is darker/richer but other than that they're pretty similar! Anonymous, thank you! I have already seen the mini sets in stores, but I'm not sure about online, I'm sorry!